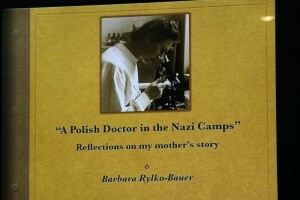 “A Polish Doctor in the Nazi Camps” is available at selected bookstores, including Barnes & Noble, and can be purchased online from Amazon.com and from the publisher, www.oupress.com. More information can be found on the author’s website: www.rylkobauer.com. On Tuesday, June 16, the Amber Circle sponsored a presentation at the American Polish Cultural Center in Troy by Barbara Rylko-Bauer, author of “A Polish Doctor in the Nazi Camps” (University of Oklahoma Press, 2014). In the book, subtitled “My Mother’s Memories of Imprisonment, Immigration, and a Life Remade,” Rylko-Bauer describes her late mother’s dramatic and often harrowing experiences as a prisoner of the Germans during World War II. Her book is the fruit of countless hours spent talking to her mother, who died in 2010 at the age of 100. Young Dr. Lenartowicz began working at the Anna Maria Hospital for Children alongside several other young doctors under the direction of experienced, highly respected medical staff. Unfortunately, Jadzia’s career and life, along with those or her colleagues, suddenly and irreversibly changed course in September, 1939, with the German invasion of Poland. Before long, the invaders had taken over Łódź and, almost immediately, imposed a harsh and brutal occupation regime in the city, as they did throughout Poland. Within weeks the Germans began systematically removing ethnic Poles from positions of authority. Many of them, including university professors, clerics and community leaders, were arrested and either executed or sent to German concentration camps. Many other professionals and intellectuals, including doctors, were also removed (and sometimes arrested), to be replaced, if deemed necessary by occupation authorities, with Germans or Poles of German descent loyal to the Nazis. Caught up in the purges, Jadzia, along with most of her colleagues, lost her position at the hospital and instead was assigned to work as a general practitioner for the social insurance system. In the meantime, in early 1940, the Germans designated part of the city as the Jewish sector, forcing out the Polish residents to make room for the city’s Jews who, in turn, had been forced out of their homes elsewhere in the city and isolated in what became the infamous Łódź Ghetto, the second-largest (after the Warsaw Ghetto) Jewish ghetto in occupied Poland. For the next few years Dr. Lenartowicz, working out of a small office that also included living quarters, and despite numerous obstacles, managed to practice her beloved medical profession. Meanwhile, the repression of Poles at the hands of the occupiers intensified, not only in Łódź, but throughout Poland (most of which the Germans had incorporated into the German Reich). In Łódź as elsewhere, countless Polish citizens were caught up in random, seemingly spontaneous, roundups on city streets. Many were sent to forced-labor or concentration camps, while a lucky few were released after harsh interrogation intended to uncover any possible links to the increasingly active and effective Polish resistance, led by the Armia Krajowa (AK). Two of Jadzia’s sisters were arrested for their involvement with the AK. One was sent to Auschwitz-Birkenau, but Jadzia was able to obtain the release of her younger sister by bribing a German official. Jadzia was not directly involved with the AK but supported the resistance indirectly by providing medical care to some of its members. She also became part of a small group that met secretly to listen to radio broadcasts from the West, an activity strictly prohibited by the Germans. It was this forbidden activity that, in January, 1944, led to Jadzia’s arrest along with the rest of the group. Her arrest, imprisonment and interrogation were merely the beginning of a long and arduous ordeal that constitutes the main part of Rylko Bauer’s account. By the time Jadzia and her remaining fellow prisoners were liberated as the war neared its end, she had spent time in three Nazi concentration camps and had endured a great deal of hardship and danger. Throughout her experience, however, she remained devoted to her vocation and responsibilities as a doctor, not only struggling to ensure her own survival but, equally important, struggling to help other female prisoners, including Jewish ones, to survive. Her courage and dedication enabled her to preserve her humanity and dignity in circumstances that conspired to make a mockery of such values. Throughout, Jadzia remained cognizant of her Polish identity, a form of patriotism that gave her spiritual strength and hope for a better future. In the introduction to her talk, Rylko-Bauer described her mother’s life as a Polish story, a war story and an immigrant story, but also as a Detroit story. She writes about her father, Władysław Rylko, a Polish Army colonel, who met and married Dr. Lenartowicz in Germany after the war. The third part of the book, titled “Surviving Survival,” recounts her parents’ arrival, with their child, “Basia,” in Detroit in 1950. 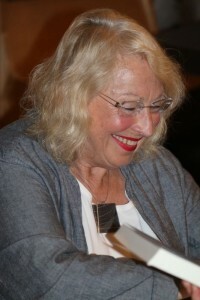 Many of Rylko-Bauer’s listeners could relate to the authentically detailed experiences of her parents during the 1950s and 1960s, including the familiar struggle to establish themselves and make a living in the midst of a Polish American community with which they often had little in common. Large segments of that community, though well-intentioned, weren’t as welcoming and supportive as the immigrants, many of them survivors of horrific wartime ordeals and nearly all of them effectively destitute, might have hoped. The author leads the reader through those difficult times when her parents and others like them, far from their native Poland which had emerged from brutal Nazi occupation only to fall under the repressive control of Soviet Communism, worked hard to build a future for themselves and, more important, for their children. Many of those children were in the audience that evening. 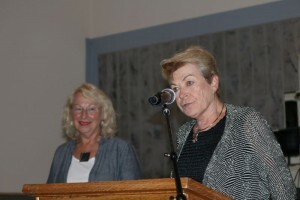 In fact, the Amber Circle, which sponsored the presentation, is a group of Polish American women, many of whom are either children of World War II survivors like Rylko-Bauer’s parents or are otherwise related (for example, by marriage or through Polish scouting) to those postwar immigrants. For those familiar with the subjects, the book rings true in every detail. It is well-researched (not surprisingly, as Rylko-Bauer, who holds a PhD. in medical anthropology, has written numerous scholarly books and papers) and offers abundant details of what life for her mother and, by extension, thousands of other Polish women was like in the hands of the Nazis. Recently the Library of Michigan named Rylko-Bauer’s book as a Michigan Notable Book for 2015. The previous evening the author addressed a large audience at the Warren Public Library’s Civic Center branch, as part of the library’s series of meetings with authors. After that presentation she noted the irony that her book seems to attract more interest among Americans who have few or no Polish ancestors than among relatively recent Polish immigrants.